Top comedians are a class apart from anything else in their industry, and the quality of Ed Byrne’s latest show Spoiler Alert re-affirms that he’s right up there. Tonight the Irishman, a regular on TV shows such as Mock The Week, poses the question: Are we too spoiled? Our nation, our political options and choices, and our kids. Especially compared to how we had it when we were young. Byrne is forever upbeat. He’s a bouncy kind of guy, and on stage there’s a jolly factor in all he says and does. Even when he complains that the Grand Opera House in York hasn’t left any snacks in his dressing room. I think this is purely an accidental irony against the name of the show, but it makes for an entertaining section of the first half of his show. He also centres a lot of his act around how he doesn’t have an AGA. It’s a fast-paced evening. And he’s pretty clear on the fact that what his successful comedy career has given him is a position in life to give his children what he never had. He considers himself lucky, there’s no question. But ask him whether he thinks his kids appreciate the position they’re in, and he might tell you the story about the electric fence! It’s a night of endless laughter, and everyone’s lapping the comedy up. It’s my first time seeing him live, and I’m really enjoying it. But it’s my friend’s second time. He loved him the first time, and he thinks this show is even better. Following an interval after the first 45 minutes, Byrne comes back on stage to a packet of snacks that someone has thrown on stage. A fun way to start the second half, and an easy ad-lib for him. And proving us Yorkshire folk are a kind bunch, there’s another lady from the audience whose bought him some too. He continues in the good form he was in during the first part of his set. The second 45 minute flying-by just as quickly, and there’s a definite natural ease to Byrne’s act. He’s in his mid-forties now, so he’s a seasoned pro and you wouldn’t expect anything less. He ventures in to political territory temporarily, but remaining firmly on topic, before ending his act as strongly as he started. And he sends us home with a short but superb encore to finish a great night. A hilarious, attitude free storyteller. 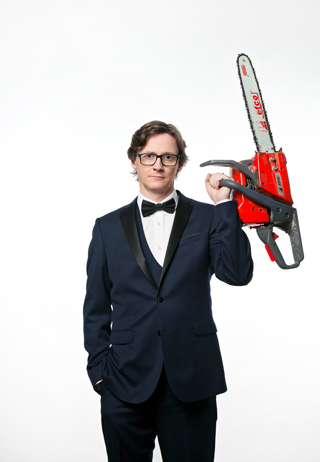 Ed Byrne certainly delivers a quality, upbeat show – and even though I enjoy him on TV, his stage show is on another level.